Includes a free preview of future issues in the collection Gemstone Cross Pendants . For more information, please refer to the Satisfaction Guarantee tab below. If you do not wish to preview future issues in the collection, you may purchase the single item using the 'Individual Item Only' tab at right. This golden crucifix is beautifully sculpted to create a dramatic, yet elegant, statement. At the heart of this distinctive cross pendant is a polished piece of genuine green jade. The smooth roundgemstone is expertly set at the center of the cross to symbolize your spiritual center. Accentuating the breathtaking green jade are 6 round DiaFlame® crystals, each one specially positioned to create optimum sparkle. The cross hangs from a classic 20" link chain that is included for FREE with your pendant. This resplendent reminder of the power of faith and love comes in a velvet gift pouch, making it an ideal gift for a christening, first communion, or any special occasion. 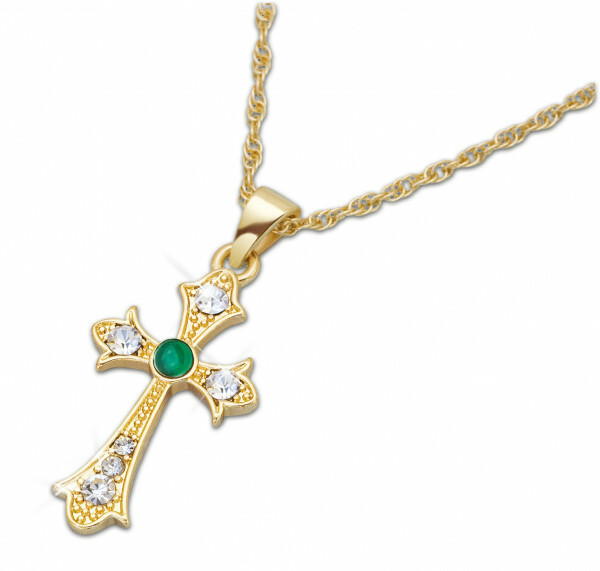 Our magnificent jade cross begins the Gemstone Cross pendant collection.